To answer this question, we travel to a brick building in Vienna, Virginia, where the hum of an industrial-sized machine is unmistakable. Littering the fenced-in courtyard of the building are massive slabs of stone of all shapes and colors. Carving of a new rosette begun by a computerized numerical control (CNC) machine and finished by hand. 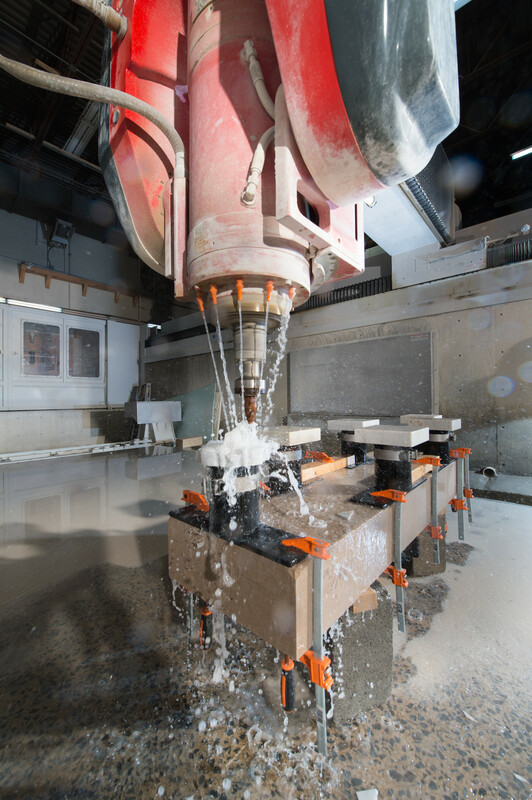 Inside, an enormous machine resembling a giant screwdriver carves marble into rosettes. The delicate features of these rosettes are hand finished by stonemasons. 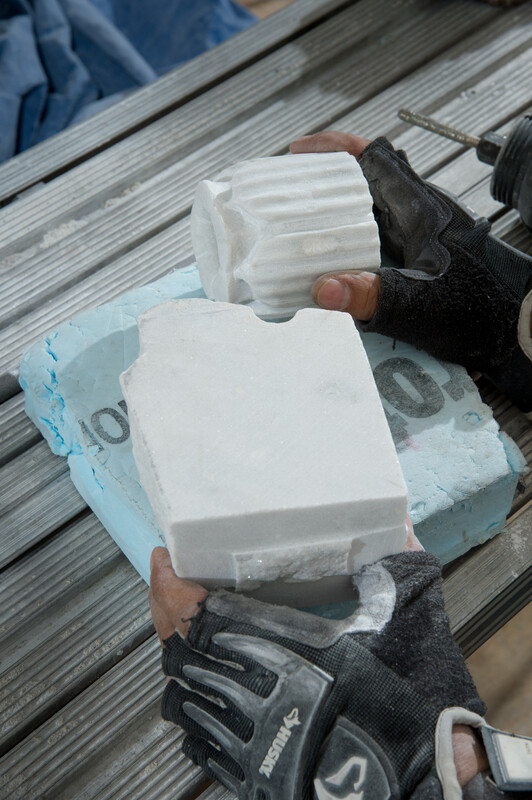 They will eventually replace degraded pieces on the U.S. Capitol Building. 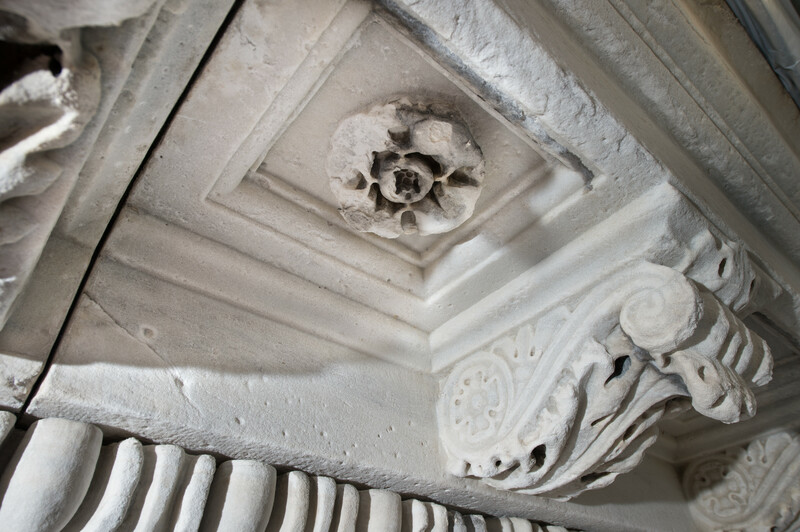 Stone preservation is a top priority for the Architect of the Capitol (AOC), and with good reason. Weather, age and deferred maintenance are destroying the finer details of the stone. Over time, cracks in the stone grow more serious and costlier to repair; ultimately the degraded stone can fall from the building causing a serious safety concern to those who work and visit the nation's capital. Deteriorated rosette, modillion and other stone elements on the U.S Capitol. The activity in Vienna is part of an ambitious and necessary multi-stage initiative known as the U.S. Capitol Exterior Preservation project. This project includes cleaning the stone and pediment sculpture, replacing the mortar and sealants at all of the stone joints, treating the carved stone and pediment sculpture, replacing stone where elements are missing or cannot be repaired and replacing bird deterrent systems. 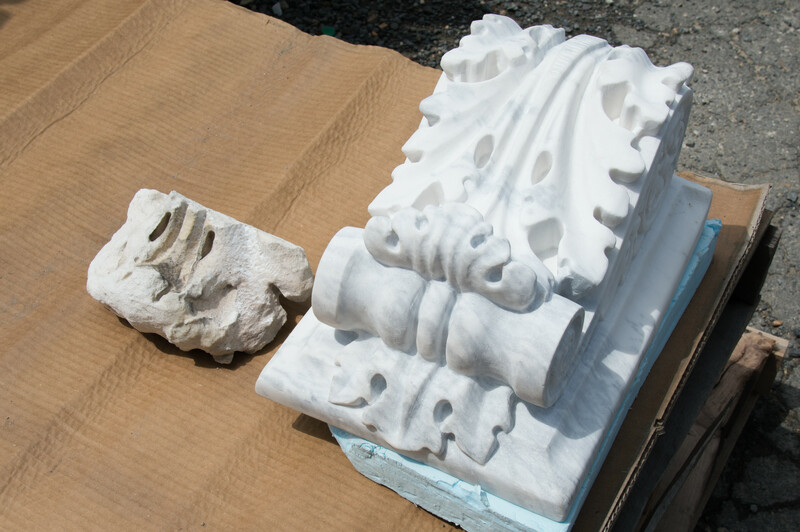 Piece of a deteriorated modillion from the U.S. Capitol (left) next to a newly carved one (right). The current focus of the project is the historic stone on the Senate Extension and connecting corridor. "Stone throughout the campus is in need of attention, but the exposure to the weather, particularly from the northwest, has made the conditions on the Senate-side of the U.S. Capitol Building most pressing," says Mary Oehrlein, Historic Preservation Officer. The stone of the Senate Extension has not had a comprehensive restoration since its completion in 1865. More than 150 rosettes and more than 50 modillions will be replaced on the Senate Extension. It takes stonemasons nearly two hours to remove a single rosette. 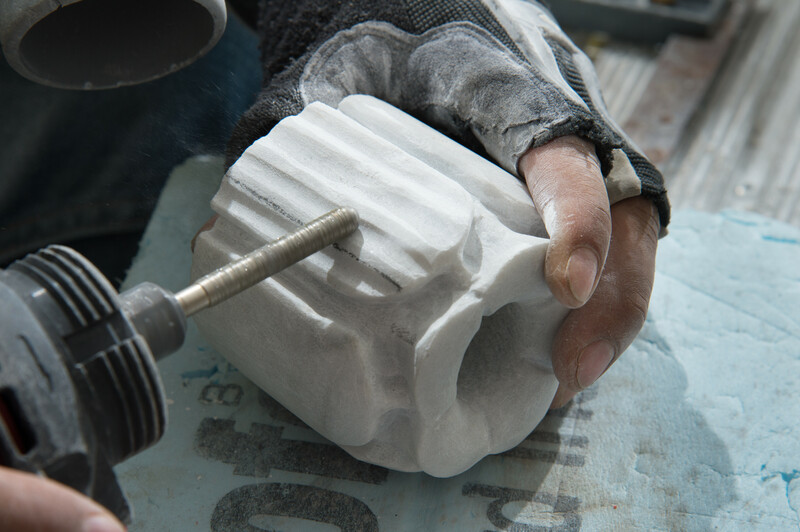 In some cases, repairs and replacement pieces are hand-carved on site at the U.S. Capitol Building. 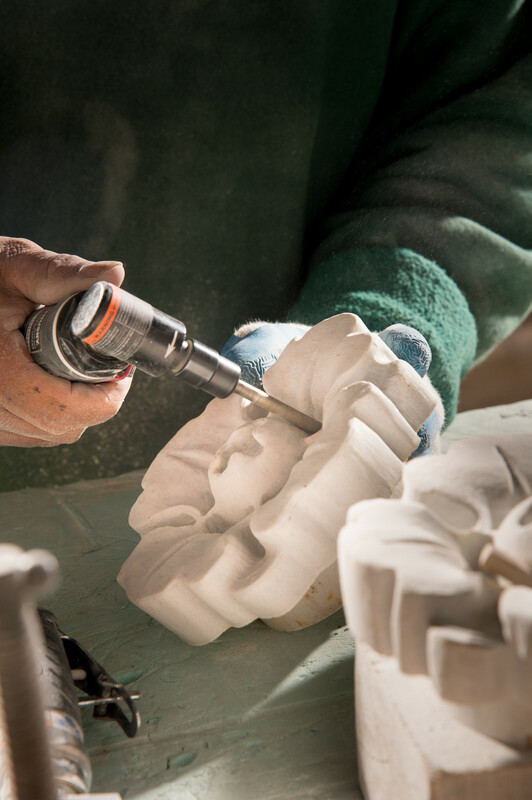 Carving of a new stone flower stamen for the Senate wing's east column capitals. Future phases of this project, targeted to begin after the 2017 Presidential Inauguration, will encase different portions of the building with scaffolding. To learn more about the AOC's stone preservation initiatives, follow project developments and get special sneak peeks behind the scaffolding on our stone project page. Great work calls for great craftsman. It must be a huge task but very satisfying to work on this prestigious building!